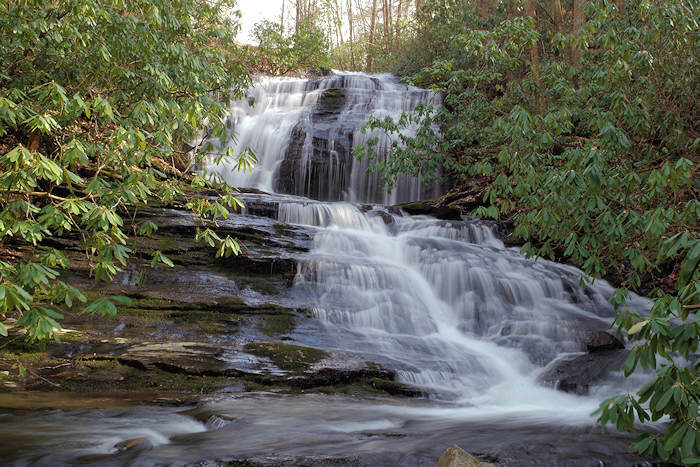 When you are visiting the waterfalls at DuPont State Recreational Forest, consider driving back toward Asheville on Cascade Lake Road to see the beautiful Merry Falls. This split waterfall is about 12 feet tall at the upper tier with a lower series of cascades that drop another 20 feet. Few people travel this scenic drive since it is unpaved, but the road is in good shape for all vehicles. While it’s roadside, the waterfall can be hidden from the road by foliage. To get a good view, you’ll need to walk carefully down a steep, unoffical trail. From DuPont State Forest, go to the end of Staton Road (1.5 miles from the High Falls access parking and one mile from Cedar Rock) to Cascade Lake Road and turn right. It will soon become a gravel road and continues five miles as winding scenic drive through the forest. Merry Falls is on the left about two miles down the unpaved portion. There is no parking area or sign. Find the exact location by opening your car window and listening for cascading water. Park along the side of the road and step down the short but very steep descent to the falls. Be careful, the slope and moss-covered rocks along the creek can be very slippery! It’s on private property, so don’t explore farther. Continue driving another two miles to Cascade Lake. You drive around part of the lake with some nice views from the road. At the end of the lake is the impressive 100-foot tall hydroelectric dam. You can stop along the road to see the dam and walk down for a closer look. You’ll see the wooden pipe that carries water about an half mile downstream to a silo and powerhouse.